Identifies the Sea of Korea. 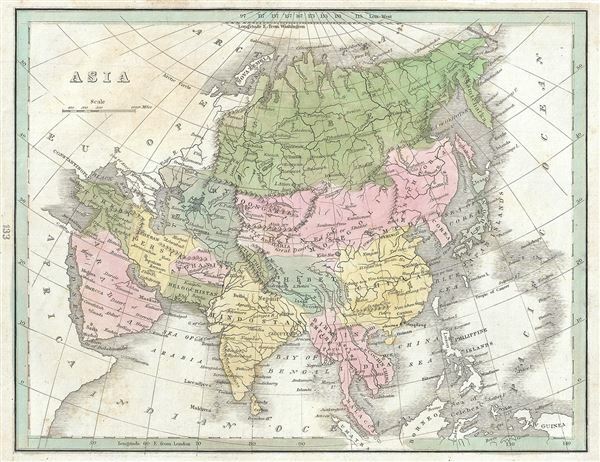 This fine 1835 map of Asia was printed by the important American mapmaker T. G. Bradford. The map covers the entire Asian continent from the Arctic Ocean to the Indian Ocean and from the Red Sea to the New Guinea. Towns, rivers, mountains, deserts, islands and various other important topographical details are noted. Hong Kong and Macao are identified in manuscript. The old capital of the Mongol Khans, Karakorum is identified, as is the Great Wall of China. The sea between Asia and Japan, whose name is a matter of political debate (either the 'Sea of Korea,' 'Sea of Japan') is here settled in favor of Korea. During this time in Russia, around 1825, Russian army officers, called the Decembrists, protested against Nicholas I's ascension to the throne. They were however defeated and some were exiled to Siberia. There, against all odds, the Decembrists thrived making significant contributions to the cultural and economic growth of Siberia. In 1856, when the Decembrists received amnesty, only some returned to European Russia. In the early 19th century Asia was coming under increasingly imperial European sway. In India, full British rule allowed England to attain naval and trade supremacy throughout the Eastern Hemisphere. Using India as a springboard, the English traded wool and Indian cotton for Chinese tea and textiles. By the 1830s, oversaturation of the Chinese market slackened Chinese demand for most British products. To make up for the trade deficit, British merchants introduced Indian opium to Chinese markets. Addictive and cheap, Opium became Britain's most profitable and important crop in world markets, pouring into China faster than tea poured into Britain. Opium addiction and its attendant social ills reached such catastrophic levels that the Chinese government took action and destroyed British opium in Canton. As this threatened English commercial interests, the crown responded, sparking the Opium Wars of 1839-1842. The superior British forces took complete control of Canton, occupied Shanghai, and blockaded Chinese ports, forcing the Chinese to sign the 1842 Treaty of Nanking. This unequal treaty (the first of many between European powers and China) granted Britain extensive trading rights in China. The map was published as plate no. 133 in Thomas G. Bradford's 1835 Comprehensive Atlas Geographical, Historical and Commercial. Bradford's atlas, published in 1835 was an important work on many levels. First, it was one of the first American atlases to follow an encyclopedic format, offering readers extensive geographical and statistical tables to supplement the maps themselves. Second, it was published in Boston and influenced the city's rise as a publishing center later in the 19th century (at the time most publishing in the United States was restricted to New York and Philadelphia). Third, this atlas was the first to contain a separate and specific map showing the Republic of Texas. Fourth and finally, Bradford's atlas in some instances broke the Euro-centric mold regarding atlas production. Among other things, Bradford focused his atlas on the Americas and abandoned the classical decoration common in European atlases in favor of a more informational and inherently American approach. Bradford published this atlas in several editions and with various partners. The first edition was published by William D. Ticktor and did not contain the iconic Republic of Texas map (although we have in fact seen Ticktor examples with a Texas map, suggesting, against conventional wisdom, that there may have been two Ticktor editions). The second official edition, published in the same year by the American Stationers Company, was the first to contain the Republic of Texas map, which is based on Austin's map, with two pages of descriptive text. A third edition was issued in 1836, also by American Stationers (though still dated 1835), and contained an unaltered Republic of Texas map with only a single page of descriptive text. A fourth edition appeared later, possibly 1837, and included an updated and revised map of Texas that replaces the old Mexican land grants with new inchoate counties. The maps from this atlas are an important addition to any collection focusing on early American cartography and Republic of Texas cartography. All maps in this atlas, though not specifically noted as such, were most likely engraved by G. W. Boynton of Boston, who also engraved most of the maps for Bradford's later publication. Thomas Gamaliel Bradford (1802 - 1887) was born in Boston, Massachusetts, where he worked as an assistant editor for the Encyclopedia Americana. Bradford's first major cartographic work was his revision and subsequent republishing of an important French geography by Adrian Balbi, Abrege de Geographie published in America as Atlas Designed to Illustrate the Abridgment of Universal Geography, Modern and Ancient. Afterwards Bradford revised and expanded this work into his own important contributions to American cartography, the 1838 An Illustrated Atlas Geographical, Statistical and Historical of the United States and Adjacent Countries. Bradford's cartographic work is significant as among the first to record Texas as an independent nation. In his long career as a map publisher Bradford worked with William Davis Ticknor of Boston, Freeman Hunt of New York, Charles De Silver of Philadelphia, John Hinton, George Washington Boynton, and others. We have been able to discover little of Bradford's personal life. George Washington Boynton (fl. c. 1830 - 1850) was a Boston based cartographer and map engraver active in the first half of the 19th century. Boynton engraved and compiled maps for numerous publishers including Thomas Bradford, Nathaniel Dearborn, Daniel Adams, and S. G. Goodrich. His most significant work is most likely his engraving of various maps for Bradford's National Atlas. He also engraved for the Boston Almanac. In 1835 Boynton is listed as an employee of the Boston Bewick Company, an engraving, stereotype, and printing concern based at no. 47 Court Street, Boston. Little else is known of his life. Bradford, T. G., A Comprehensive Atlas Geographical, Historical and Commercial (Boston), 1835. Very good. Original platemark visible. Minor spotting at places. Blank on verso. Some cities noted in manuscript.